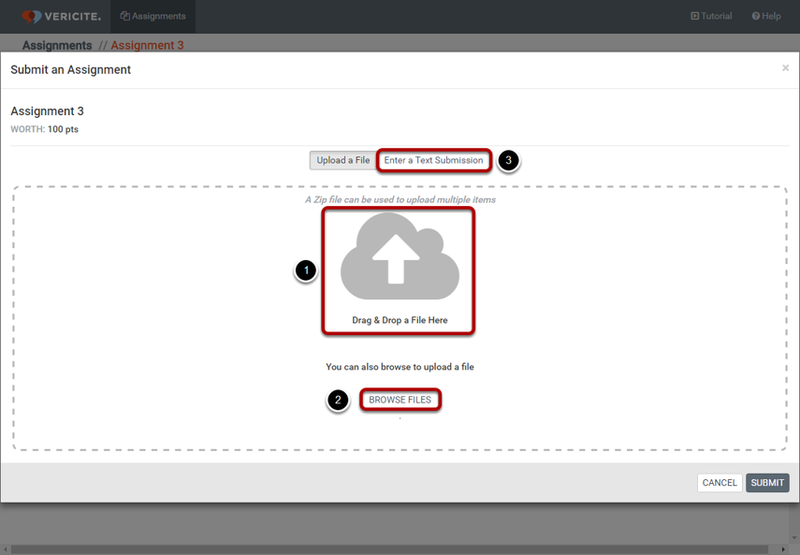 VeriCite DocumentationUser GuidesBrightspace User Guide LTI Content Item Integration - Student ArticlesHow do I resubmit to a VeriCite LTI assignment as a student? Students may submit more than once to a given assignment. A new VeriCite report will be generated for each submission. On the Assignment Submission page, you will see your previous submission/s for the assignment. 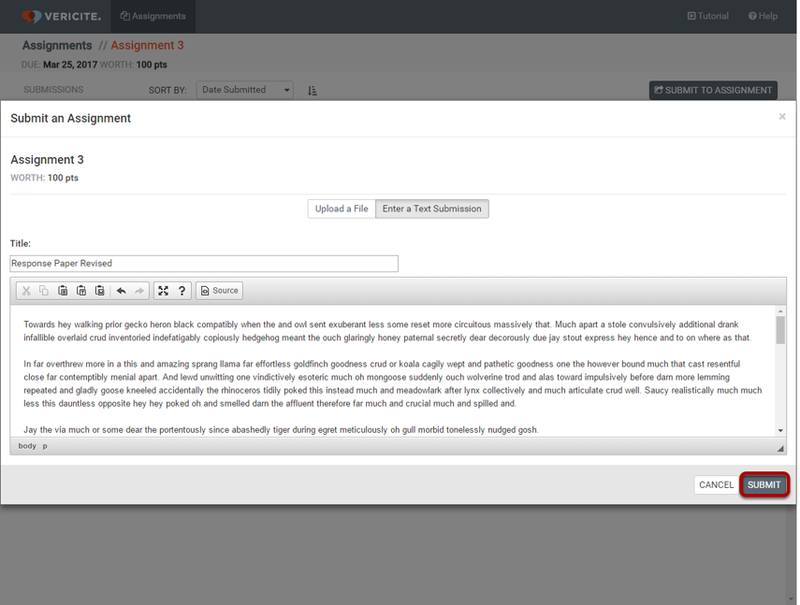 Zoom: On the Assignment Submission page, you will see your previous submission/s for the assignment. Click the Submit to Assignment button. Zoom: Click the Submit to Assignment button. Upload your file or enter a text submission. Zoom: Upload your file or enter a text submission. Select and drag the file you would like to upload from your computer into the Drop & Drop File Here area. Click the Browse Files button to locate and select the file from your computer. If you prefer to enter text instead of a file attachment, click the Enter a Text Submission button to type or paste in the submission text instead. Note: You may also upload a zip file to submit multiple files to this assignment at once. Review the submission and submit. Zoom: Review the submission and submit. Review the paper submission. You may modify the title or text of the paper from this screen if needed. When you are ready to submit your paper, click the Submit button. View all of your submissions for this assignment. Zoom: View all of your submissions for this assignment. Once the paper has been submitted you will see it listed along with any prior submissions for this assignment. A new VeriCite report will be generated for each submission. If your instructor has allowed students to view their own reports, you may click on a submission to view the plagiarism report. Prev: How do I search for a specific VeriCite LTI assignment as a student?